Pleats are categorized as pressed, that is, ironed or otherwise heat-set into a sharp crease, or unpressed, falling in soft rounded folds. Pleats sewn into place are called tucks. A vertically hanging piece of fabric such as a skirt or a drape will often be described in terms of its "fullness." Fullness represents the thickness/ depth of the pleats in relation to the original width of the fabric: fabric sewn at "zero fullness" would actually be flat and have no pleats; fabric sewn at "100% fullness" is pleated so that it takes up exactly half as much width as it would if it were not pleated at all (i.e., 24 inches would be pleated down to 12 inches); if sewn at "150% fullness," the unpleated fabric would be two and a half times wider than the final pleated piece (i.e., an unpleated 30 inches would end up as 12 pleated inches of fabric: 12+1.50(12)=30); if fullness were to be "50%", the original fabric would be one and a half times the width of the pleated (i.e., 18 inches of width would end up as 12 pleated inches: 12+0.50(12)=18), etc. Accordion pleats or knife pleats are a form of tight pleating which allows the garment to expand its shape when moving. Accordion pleating is also used for some dress sleeves, such as pleating the end of the elbow, with the fullness of the pleat gathered closely at the cuff. 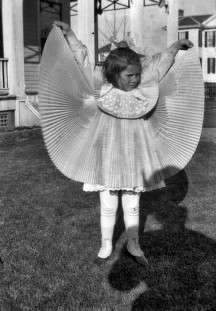 This form of pleating inspired the "skirt dancing" of Loie Fuller. Accordion pleats may also be used in hand fans. Box pleats are knife pleats back-to-back, and have a tendency to spring out from the waistline. They have the same 3:1 ratio as knife pleats, and may also be stacked to form "stacked-" or "double-box pleats". These stacked box pleats create more fullness and have a 5:1 ratio. They also create a bulkier seam. Inverted box pleats have the "box" on the inside rather than the outside. Cartridge pleats are used to gather a large amount of fabric into a small waistband or armscye without adding bulk to the seam. This type of pleating also allows the fabric of the skirt or sleeve to spring out from the seam. 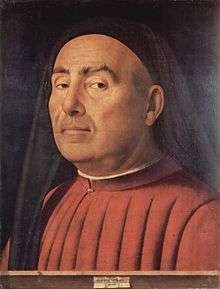 During the 15th and 16th centuries, this form of pleating was popular in the garments of men and women. Fabric is evenly gathered using two or more lengths of basting stitches, and the top of each pleat is whipstitched onto the waistband or armscye. Cartridge pleating was resurrected in 1840s fashion to attach the increasingly full bell-shaped skirts to the fashionable narrow waist. Fluted pleats or "flutings" are very small, rounded or pressed pleats used as trimmings. The name comes from their resemblance to a pan flute. Honeycomb pleats are narrow, rolled pleats used as a foundation for smocking. Kick pleats are short pleats leading upwards from the bottom hem of garments such as skirts or coats, usually at the back. They allow the garment to drape straight down when stationary while also allowing freedom of movement. 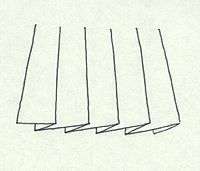 Organ pleats are parallel rows of softly rounded pleats resembling the pipes of a pipe organ. Carl Köhler suggests that these are made by inserting one or more gores into a panel of fabric. Plissé pleats are narrow pleats set by gathering fabric with stitches, wetting the fabric, and "setting" the pleats by allowing the wet fabric to dry under weight or tension. 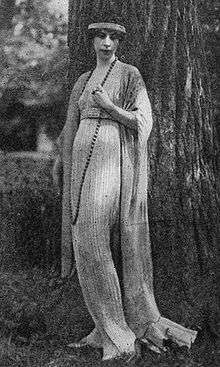 Linen chemises or smocks pleated with this technique have been found in the 10th century Viking graves in Birka. Rolled pleats create tubular pleats which run the length of the fabric from top to bottom. A piece of the fabric to be pleated is pinched and then rolled until it is flat against the rest of the fabric, forming a tube. A variation on the rolled pleat is the stacked pleat, which is rolled similarly and requires at least five inches of fabric per finished pleat. Both types of pleating create a bulky seam. 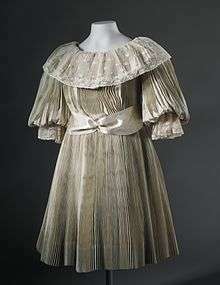 Watteau pleats are one or two box pleats found at the back neckline of 18th century sack-back gowns and some late 19th century tea gowns in imitation of these. The term is not contemporary, but is used by costume historians in reference to these styles as portrayed in the paintings of Antoine Watteau. Kingussie pleats, named after town in Scotland, are a very rarely seen type of pleat used in some Scottish kilts. They consist of a single centrally located box pleat in the rear of the kilt with knife pleats fanning out on either side. The knife pleat is the basic pleat used in sewing. Knife pleats with the construction and seam stitches shown. Box pleats for a skirt. One or more kick pleats may be set near the hem of a straight skirt to allow the wearer to walk comfortably while preserving the narrow style line. 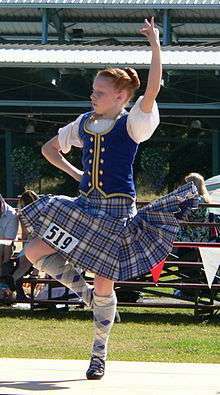 Modern kilts may be made with either box pleats or knife pleats, and can be pleated to the stripe or pleated to the sett (see main article Kilts: Pleating and stitching). Pleated trousers were popular before World War II; fabric rationing during the war precluded the style, and flat front became the standard by necessity of cloth shortages. Pleats on men's trousers remains a classic style option suited for more traditional looks, while flat front pants are a more recent on-trend fashion. ↑ Arnold, Janet: Patterns of Fashion 1 (cut and construction of women's clothing, 1660–1860), Wace 1964, Macmillan 1972. Arnold, Janet: Patterns of Fashion 1 (cut and construction of women's clothing, 1660–1860), Wace 1964, Macmillan 1972. Revised metric edition, Drama Books 1977. ISBN 0-89676-026-X. Wikimedia Commons has media related to Pleats.